With telemedicine as a focus in this issue of Arkansas Hospitals, I wondered about its possible connection with the Baldrige Excellence Framework. So I reached out to the senior leaders of two of our healthcare clients – Methodist Health System (Methodist) and Kindred Nursing and Rehabilitation Center-Mountain Valley (Mountain Valley) – for inspiration. Yet, achieving excellence is just the beginning of the journey. Maintaining improvements while continuously looking for additional opportunities to improve requires a strategic approach to avoid the “one and done” mindset that can lead us to revert to the old way of doing things. At the CAMC Health System in Charleston, West Virginia, we found our organizational performance accelerated as we became process driven. We rely on the Baldrige Performance Excellence Framework to guide us in creating a systems approach to process improvement for quality and safety. Integrating this framework throughout our organization led to development of our Leadership System, Enterprise Model, Performance Improvement System, Workforce System and Strategic Planning Process. Our strategy is to follow the Baldrige way to continuously improve. 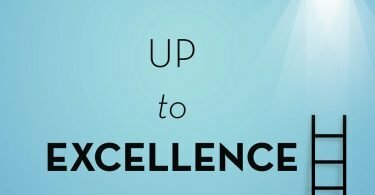 If your health care organization has not yet tried improving processes by committing to and applying the Baldrige Excellence Framework, we urge you to seriously consider doing so. This article will acquaint you with some of the Baldrige terminology and will show you how our system has innovated to achieve sustainable excellence. We hope you will be able to see how your hospital/system can do so, too. At CAMC, the epicenter of our approach is a fully-aligned and integrated strategic planning process that brings our corporate goals down to every department and to every employee. The outcome has been the true engagement of our workforce in improving performance! So, how are these key systems used to build and sustain a workforce culture and mechanism to drive organizational excellence and high performance? It Starts with LeadershipOur mission and vision form the foundation of the leadership system. 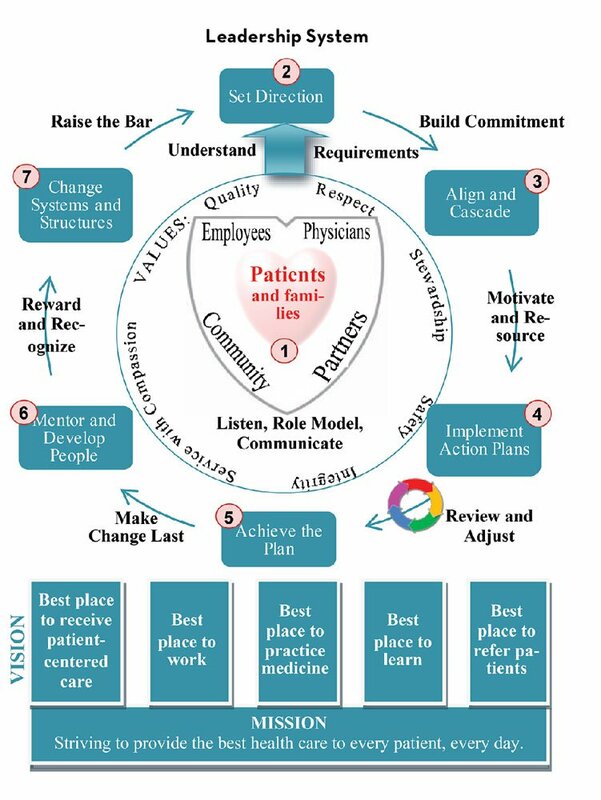 Leaders in our organization must understand the key requirements of our patients and families and those of our key stakeholders (employees, physicians, partners and community). They must then be able to do the work of leading: set direction, align and cascade goals, implement action plans, achieve the plan, mentor and develop people and change systems and structures. In addition, our leaders cannot delegate the responsibilities of building commitment, motivating and resourcing, reviewing and adjusting, making change last, rewarding and recognizing and raising the bar. Leadership skills become well-honed and operationalized as individual leaders do their self-evaluation for each of these requirements; they obtain input from their manager and team, and then they establish a Learning and Development Plan to address opportunities for improvement. Our education team then aligns our organizational education programs to support skill development for these requirements. At CAMC, we recognize that sustained excellence cannot be achieved without the foundation provided by a skilled and committed leadership team. The Enterprise Model shows a high-level view of each system within CAMC. EnlargeThe Enterprise ModelNext, we knew it was important for every member of our workforce to understand how his or her job helps CAMC meet its mission. Everyone’s job, no matter how large or small, is essential to our success, and everyone has a role to play in sustaining excellence. The Enterprise Model helped us understand and visualize this. The Enterprise Model is a high-level representation of the organization’s mission, functions, processes and systems. At CAMC, we have designated three types of systems: systems that guide; systems that do work; and systems that support. Our enterprise model highlights how each system relies upon the other for meeting patient needs. In a state with a declining population, one of the oldest populations in the nation and 80% government payers, we must design our work systems and work processes to not only deliver the best care for our patients, but also to increase our competitive advantage as a low-cost provider in our region. The Magic Happens when Goals AlignMost organizations have goals. And people who work in these organizations have goals, too. But we see magic happen when corporate goals align with hospital goals, departmental goals and individual goals. Such goal alignment improves outcomes and operations, boosts employee morale and creates ownership of the organization’s success. Most importantly, it also leads to more satisfied patients who benefit exponentially from smoothly running processes and motivated workforce members. CAMC Health System’s Goal Cascade Process is used to align the organization’s annual goals throughout the entire system and with those of every department. Deployment of the plan throughout the organization has been instrumental in creating excellence. Cascading goals is the process of taking the overall goals of the company, then adopting related goals and activities at different levels within the company to ensure that our departmental and individual activities and objectives are aligned with the long-term goals of the company. CAMC uses “Top 5 Boards” in all departments to bring our goals into the day-to-day work of our employees. 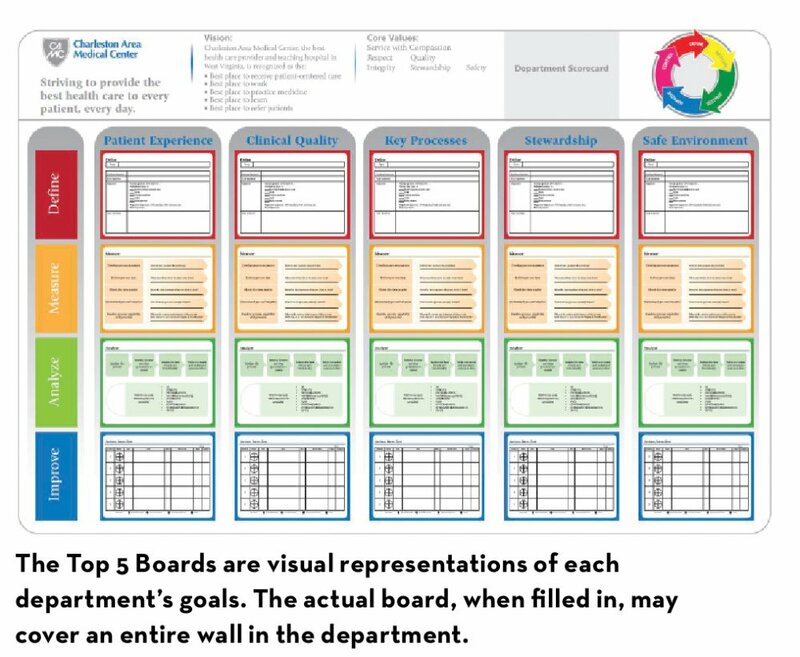 Our Top 5 Boards are 4×6-foot boards in each department, each with five columns that address the define, measure, analyze and improve components of our performance improvement methodology. Each column shows the work of a department improvement team addressing an issue that comes (or “is cascaded”) from our overall corporate goals. Every person in the department participates on one of the five improvement teams. This creates an environment where each person understands his or her goals, how they relate to the corporate goals and how (and what) to improve. These boards create transparency of goals, action plans and results to drive the culture of quality and safety. The Top 5 Boards are located in visible areas so that the performance improvement work is fully transparent to the workforce, patients and visitors. The goal cascade has been instrumental in improving overall organizational results by ensuring our focus remains on key improvement areas. For example, a key measure (what we call a BIG DOT) under our quality pillar is Value-Based Purchasing–Hospital-Acquired Infections. This is cascaded to applicable nursing departments as CAUTI (Catheter-Associated Urinary Tract Infections). 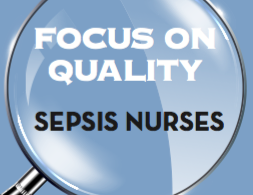 The nursing departments have CAUTI as a Top-5 Board improvement project and monitor the implementation of “bundles of care” that need to take place every day to prevent these infections. As a result of this focus, CAMC’s CAUTI rate for 2016 was 0.30, which is better than the Centers for Medicare and Medicaid (CMS) top-quartile performance of 0.90. Not only are clinical results improved, our Top 5 Boards have the added value of engaging employees in their daily work to achieve corporate goals. As a cycle of learning, to continue our focus on sharing best practices and knowledge management, we have added Top 5 Board report outs from each of our hospitals and corporate areas. It becomes readily apparent that our Leadership System is aligned with strategic planning. Leaders must set direction, align and cascade, implement the plan, and achieve the plan at every level of the organization. The CPICU team stands in front of the department’s Top 5 Board.Closing the Loop – Performance ManagementThe Performance Management System closes the loop for sustaining excellence. At the organizational level, we use the BIG DOT report of our key measures to review organizational performance quarterly with our Board of Trustees. Each corporate entity, hospital and corporate department has an aligned scorecard that is then cascaded to each department and individual performance planner. Performance reviews are based on accomplishment of these cascaded goals. At the department level, accomplishment of Top 5 Board results is a significant percentage of the annual review process. A key cycle of learning for us was to ensure that we only address goals that we can directly impact at each level; otherwise, we dilute our impact and create what our workforce calls “busy work,” which is a waste of their time. There is no greater satisfaction than seeing an enthusiastic Top 5 Board team member share about the work of the team and how they have directly impacted achievement of a goal. • The Baldrige Criteria align with and support required accreditation processes. Show the connections! We are working toward ISO certification to support the Baldrige criteria focus on processes. • Transparency supports engagement and is required to drive commitment. Through the Goal Cascade Process, CAMC Health System shares its strategic direction and the “why” behind its plans. • Having systematic processes in place (including CAMC Health System’s Organizational Sustainability Framework) helps prepare health care organizations to work through the challenges and instability of delivering health care in today’s environment. Our InvitationSustaining the excellence you have created through programs, projects and just plain hard work is a challenge in today’s health care setting. We invite you to join us on the Baldrige journey. By committing your organization to use of the Baldrige Performance Excellence Program, we believe you, too, will see systems improvement, better employee engagement and higher satisfaction at all levels, including the most important – your patients and their families. As Chief Strategy Officer, Brenda Grant is responsible for development and deployment of strategic and business plans for the CAMC Health System. She has served as a Senior Examiner for the Baldrige Performance Excellence Program and is a judge for The Partnership for Excellence. CAMC won the Malcolm Baldrige National Quality Award in 2015, and Brenda continues to lead the CAMC Health System’s Baldrige efforts. Find more about the Baldrige Way at www.nist.gov/baldrige. The above article is from AHA, a custom publication of Vowell, Inc., which also produces Arkansas Money & Politics.